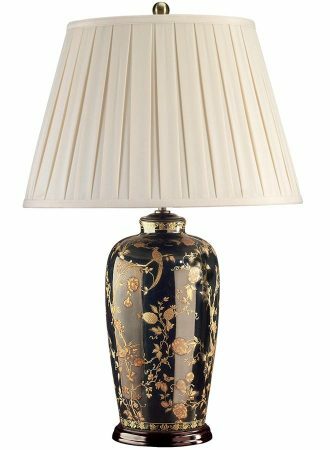 The Black Birds ceramic vase table lamp in black and gold with cream pleat shade is hand painted with a classic oriental body and turned wooden base. Gloss black glazed base colour with intricate gold birds and floral blossoms design in a striking contrasting overlay. Supplied with an 18″ double pleat cream polycotton lamp shade as shown. A classic Chinese porcelain table lamp that looks just as good in a contemporary or traditional room. Perfect for a dining room sideboard, living room table and fitted with a convenient inline cable switch.